2013 - "Doing a 360 into ONENESS"
2012 - Honoring the Rev Dr MLK Jr.
"Consider This..." delivered thought-provoking, in-depth programming with spiritual evolutionary luminaries, authors, scholars and teachers on the cutting-edge of an integral life, collaborating to raise personal and planetary consciousness for a New Earth. Check it out - InJoy! 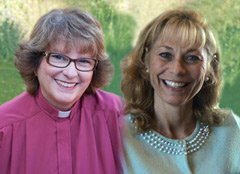 This lively ARCHIVED radio show offered joyful and timely discussion with veteran, interspiritual ministers, co-hosts, Rev. Dr. Linda Marie Nelson and Rev. Dr. Nancy Ash, as well as a "Doing a 360" segment to re-calibrate listeners into a higher vibratory frequency through unique, free online meditation, relaxation and imagery with beautiful and powerful music. "Consider This..." presented quality non-religious, spiritual programming honoring all perspectives and traditions that will inspire, educate, and motivate you to learn while opening your heart to the multiple ways that we, as aware and integral minds are dedicated to transforming our world to Oneness. We always joyfully closed the shows with: "Until next time, you're cordially invited to consider this: Be OPEN to another's point of view. We LOVE you ~ Thank you."